Basically Frightened is a story about one man’s travels, trials and tribulations in a post-apocalyptic Britain. Finally venturing out to break his cycle of hermitage, the narrator searches to find a group to join in the fight against the end of humanity. He finds group after gang after collective after family. When he finally discovers an eclectic community that takes him in and allows him to stay, he tries to fit into the environment. Sometimes, one can try too hard to fit in and the main character finds this out in spades. 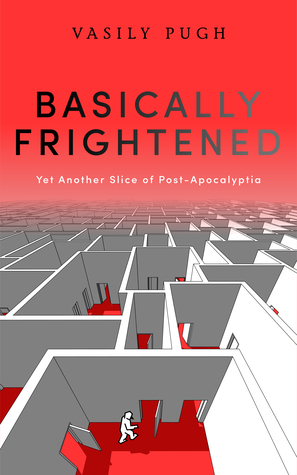 Basic Frightened is a delightful story about one of the most depressing topics: The End of the World. The Narrator has a wit about him throughout the entire story that is both engaging and endearing. The entire time reading this book and the terms ‘Keep a stiff upper lip’ and ‘Keep Calm and Carry On’ kept coming to mind like a gentle yet firm reminder. The characters that the protagonist can be a bit stereotypical and the story itself follows a well-trod path, but neither of those should keep this book from a wide spread audience. The Narrator, ‘Buckaroo Bonzai’ as he likes to call himself because he never reveals his name, has similarities to other heroes of the wasteland that was once civilization: Strong sense of right and wrong, unique skill-set to help benefit those around him and the courage to do what’s right. Whereas the other ‘nameless’ or legendary characters, ‘Buck’ stands out due to the genuine and compassionate personality he exudes. Throughout the entirety of the book, ‘Buck’ allows the audience to peak not only into the corners of his own mind but why the world is the way it is. And none of it feels forced or rushed. The narrator combines stories from his own life and bits of trivia from everyday life (ranging from movies, hence the chosen name, to celebrity gossip) and allows the reader to step immediately into the current situation. This is a mark of a talented writer. The author, Vasily Pugh, has a way of weaving a story together without being overly dry (and one could say British) or being overly sappy either. He allows the story to be dramatic and deep and then has a scene where the characters are talking about a modern day chamber pot. The dialog feels natural and the references that give the reader a mental landmark to guide themselves show a well-designed thought process. Other stories and media that deal with this subject matter tend to be gloomy (for good reason of course) and deal with the human aspect of apocalypses. Mr. Pugh has done the latter with being able to bring a fresh new look on the former. The content, while a bit done before, is still a fresh take on a subject that has been prevalent as of late. In summary, Basically Frightened is truly ‘another slice of Post-apocalyptia’ but one in the same vein of the devilishly too short lived television series ‘Pushing Daises’. A look at a dark subject matter (murder and death/the end of the world) and showing it in an incredibly bright and almost fanciful manner. This book should and will be a best seller one day. Or at the very least, the fantastic first step in a great literary career.